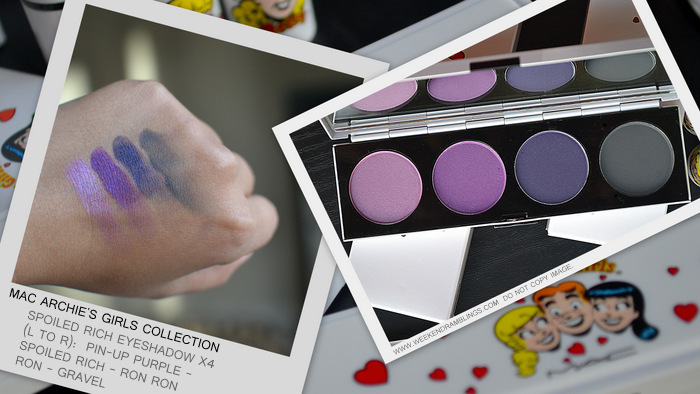 MAC Archie's Girls Collection (available here): The ravishing rivals for Archie's affection inspire a colour collection celebrating their iconic personas. Smoulder in deep and seductive tones inspired by spoiled rich girl Veronica or beam like blonde-next-door Betty in soft and innocent shades for eyes and face. So gorgeous in exclusively designed packaging. Limited edition. I haven't yet used anything enough to review, but I sure did get the time to snap some quick photos before the sun went down. 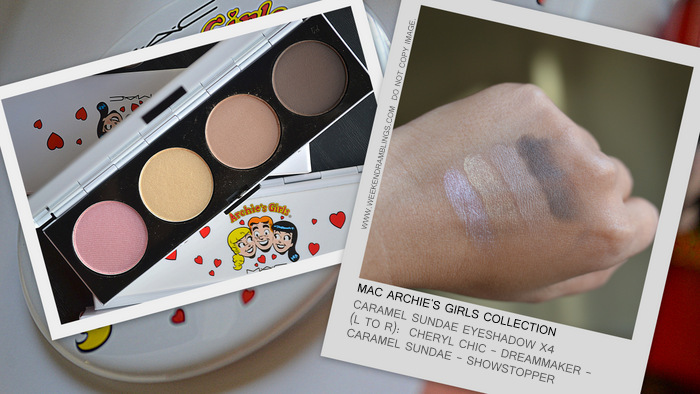 Here's a look at what I bought from the MAC Archie's Girls Collection and some swatches. Strawberry Malt is a little less bright than what it looks like in the swatch - my camera just goes crazy with that color! My favorites among the lipglass would be Kiss & Don't Tell, Summer Sweetheart, and Mall Madness (which I suspect might be the only one that works for me). 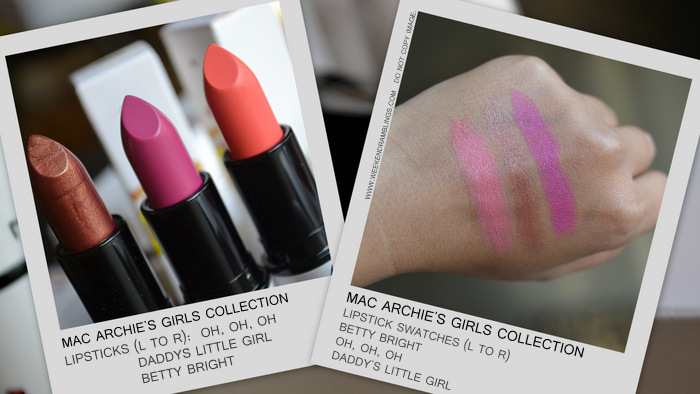 MAC Archie's Girls Collection Lipsticks. I picked up two of the Betty lipsticks and one from Veronica's side of the collection. I really shouldn't have bought this blush - anything with "light" in it won't show up on my darker skin tone! It's a lovely color, though, for anyone with a lighter skin tone. Neutral/brown eyeshadows - of course, I love this quad! Plus, the colors seem to show up easily enough on my skin. Gravel was the only one that seemed a bit too powdery and a little difficult to swatch. 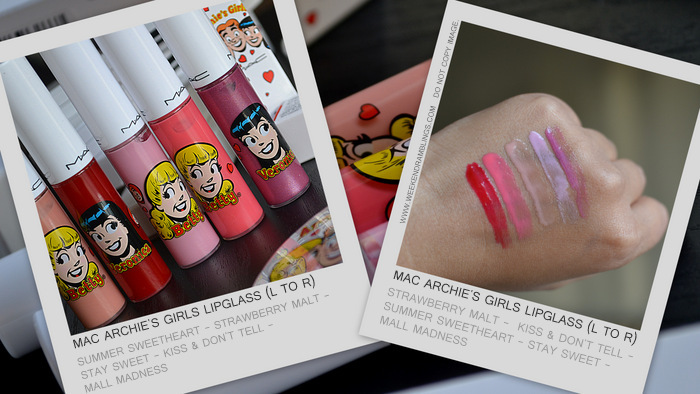 Did you pick anything from the MAC Archie's Collection? Do share! Hehehee :D Though, with MAC I like that stuff isn't terribly costly! Ugh! Gia!!!! Am so sorry..the comment disappeared. Blame it on blogger...am so sorrrry..
Anywayyy..to answer your question. No, I think it will be a while before they launch in India, I guess. i do rem we said .. we are not betty and veronica but babessss ..... WE AREEEE ..... trust me ....we areeee ..
:D :D :D I didn't want to get anything....then the gloss got on to the list..and Prom Princess..only cos it would show on my skin tone..so sensible..and see what I ended up with!!!! Am sure a lot of the Betty products would look amazing on you. Great swatches. I've been looking forward to this collection. I think I'm going to get the Spoiled Rich Eyeshadow Quad as I love purple shadows. 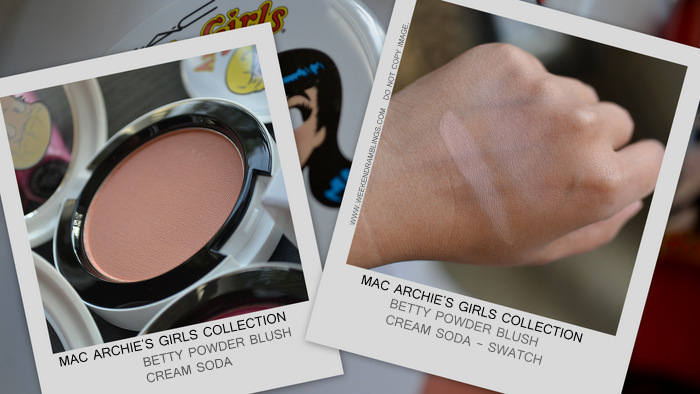 Am sure you will like this one..Well, there are probably some better colors/textures in the regular MAC lineup, but no cute packaging then! The packaging!!! Sigh...drool, drool. MAC press releases say they are already in stores in India but the MAC stores in Mumbai at Palladium and Altamount Road say they probably might not get this in store at all! What??? Boohoohoo, not fair. My lust list includes, Spoiled Rich palette, Mall Madness gloss, Prom Princess blush and Betty Bright lipstick. Already in stores in India? That would be quite a shock..pleasant one..but shocking all right! Most stores here in the US are just getting the collection. My local store has their event on Feb 7th and the SA told me they would be getting the collection on Feb 5th. It's really nice, though, isn't it if Indian stores get collections about the same time as they release in the US? I have been bewildered too with their "now in store" press release. Would be a dream come true if they start launching here at the same time! :D :D :D Where did you see this press release anyway? Hi Harman..guess it will be available in India soon enough (am assuming you are in India). Most collections seem to launch there in about a month's time, don't they?